thank you, thank you, thank you! and a Twelve Days update. Wow, guys! Thanks so much for making this annual pattern sale the best ever. I really appreciate it! Y'all have some sewing to do! Chop chop! 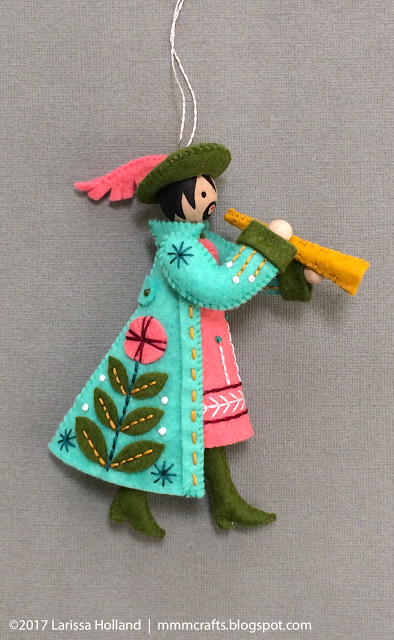 Many have asked if the Lady Dancing and Lord a-Leaping patterns will be out in time for Christmas crafting. My goal is to finish the Twelve Days ornament series in 2017 and I still have that clearly in my sights, but oh my dears...thanks to the move that took up my entire summer, I'm afraid I will need every last minute left of 2017 to accomplish it. I don't want to cut corners or rush the grand finale to this series and I'm sure you don't want that either! Lady Dancing is in progress now and will maybe release in time for Christmas (no promises! ), but I will probably be running right up to December 31st at midnight to release Lord a-Leaping. Thanks a million to many of you who have sent me encouraging messages and positive reviews on my patterns. You know what a huge boon that is to a micro-business, and also to me personally. It keeps me going! That and a lot of coffee. Let's do this! 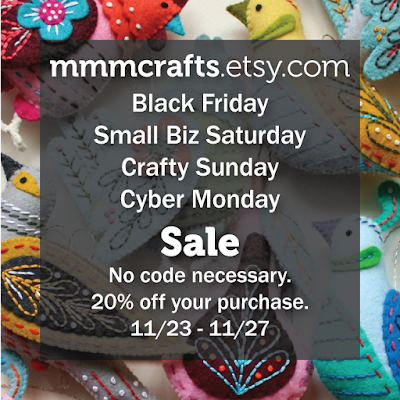 black friday/small biz saturday/crafty sunday/cyber monday -- in short, there's a sale. Have you been waiting? My annual pattern sale is here! 20% off your purchase of any digital patterns in my Etsy shop. If you purchase an already discounted pattern bundle that means even more savings! This is how I like to do all my Black Friday shopping: in my comfy chair, wearing pajamas. I wish you guys a peaceful and happy weekend, and yes, you may now play Christmas music. 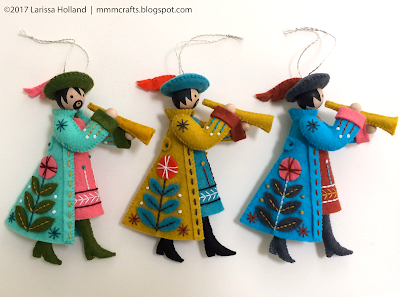 All three of the Pipers Piping up at the top ^ there were made using this ^ Benzie wool-blend felt in my pre-chosen palette #4, which covers two of my Twelve Days ornaments: Colly Bird and Piper Piping. Thanks again for organizing that bundle listing, Renae! 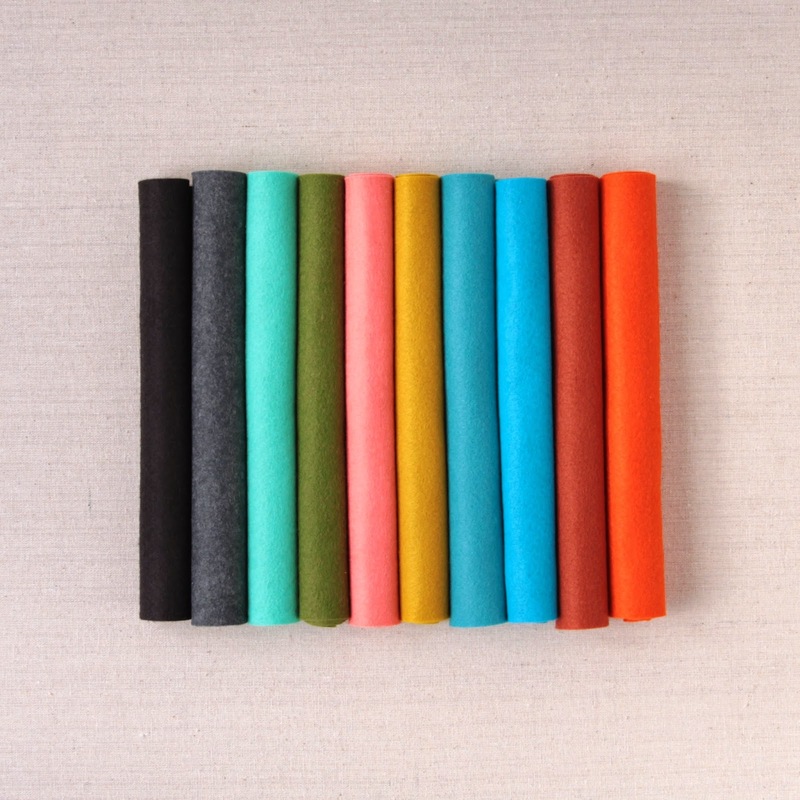 You can purchase the felt bundle with or without the matching flosses, which is a nice option. 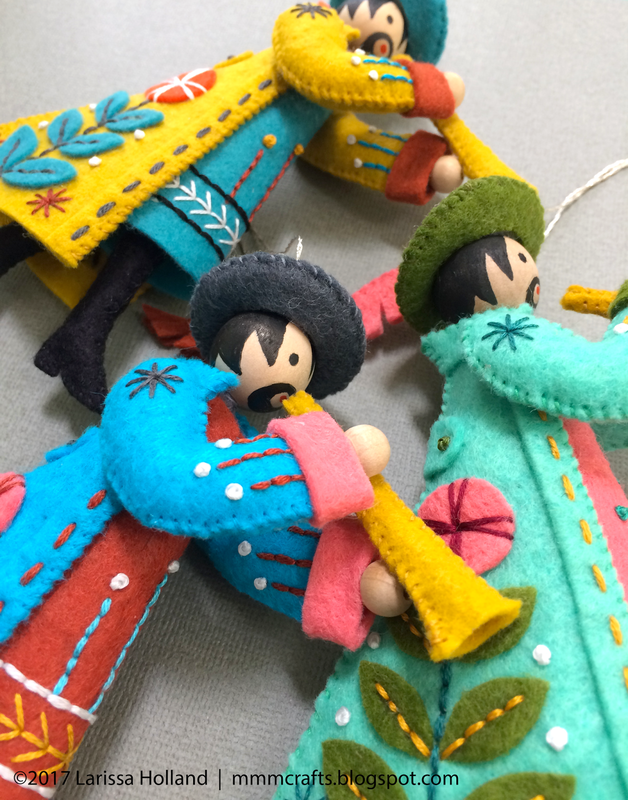 You'll need matching floss anyway to sew your ornaments together, so having the pre-matched flosses comes in handy! 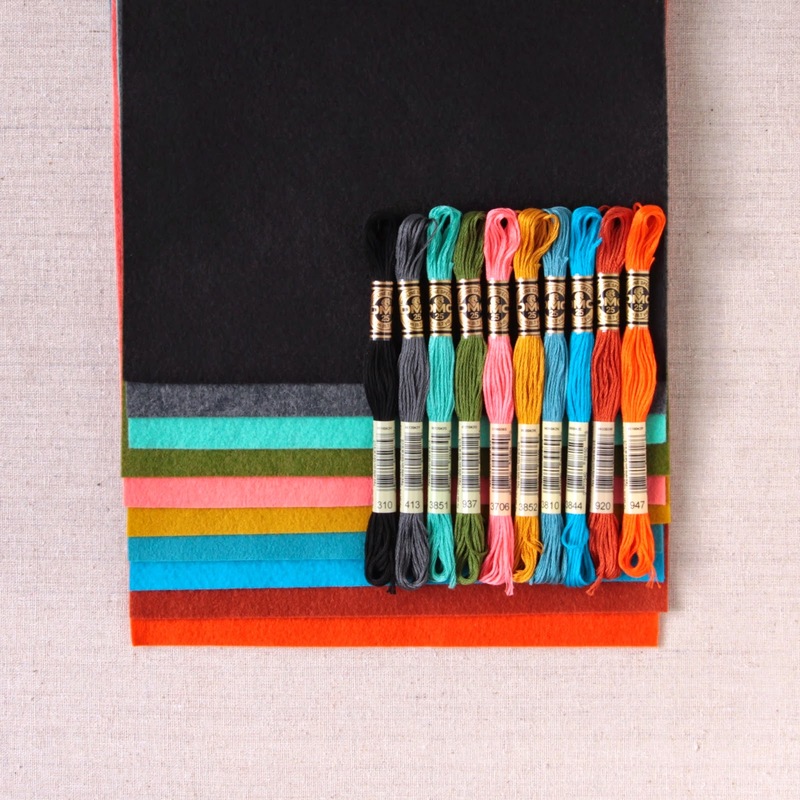 NOTE: You will still need to purchase floss for the contrast decorative embroidery! There are a total of six curated bundles of Benzie felt for the Twelve Days patterns, and you can purchase them all under that same Benzie listing in the drop down menu. 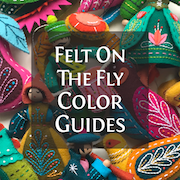 See this post for links to all of color guides. Piper Piping pattern now available! 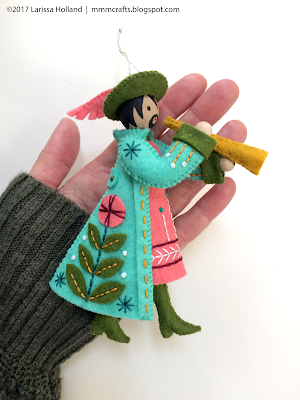 I'm so happy to tell you that this 10th pattern in my Twelve Days series of ornaments has piped his way into my Etsy and Craftsy shops! 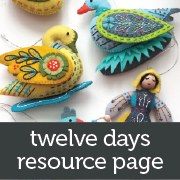 If you'd like to read more about my Twelve Days series, here's the resource page. You may think to yourself, Wait a minute...Pipers are not number ten. They are number eleven! And you'd be right...in the modern version of the carol. But my Twelve Days series is a throwback to the original carol from 1780, so the order is a bit different. 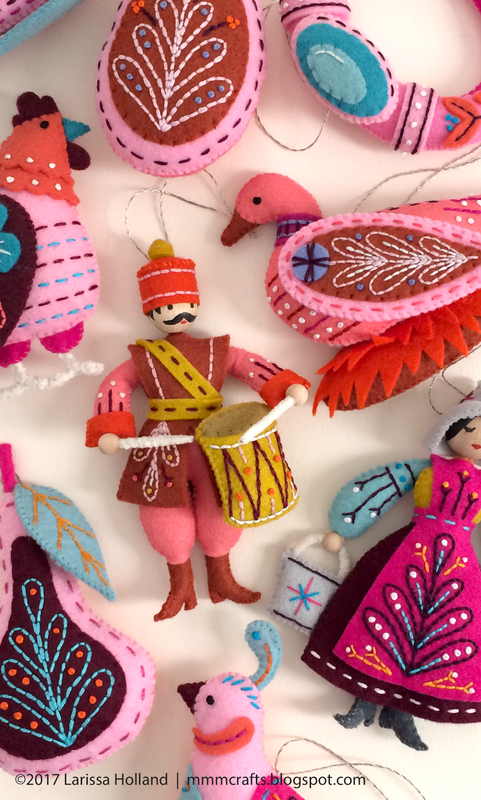 But here's the beauty of DIY -- you can number your ornaments any way you'd like. Huzzah! 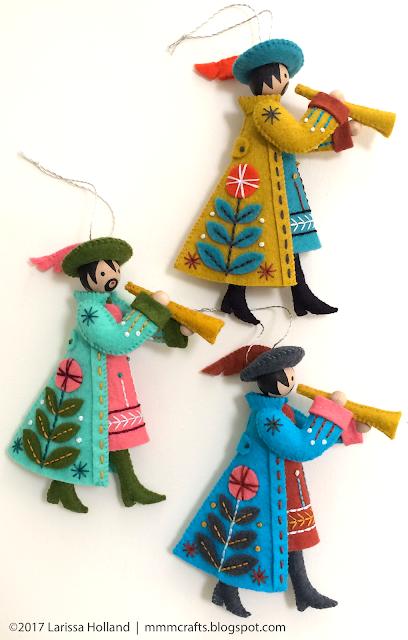 All three of these ornament samples were made using Benzie felt from the Bundle #4 (Colly Bird and Piper Piping). 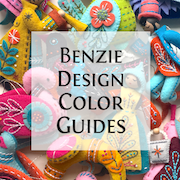 I will be posting a specific Benzie felt and floss color guide soon so you can make ornaments in these same colors if you like! These ornaments are much easier to make than you might think because of a magical, printable Sulky stabilizer that adheres to the wool felt. You basically print my pattern to the stabilizer, stick it on the felt and embroider on the lines. No pattern piece tracing or embroidery transferring. It's FANTASTIC. I really enjoyed the design of this one. 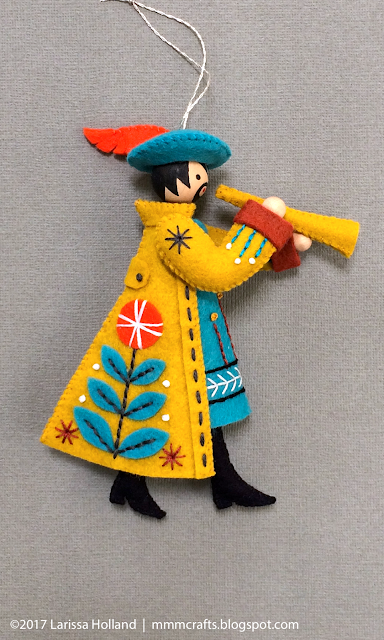 I like the look of the fishbone embroidery on his tunic, and his feathery hat. I wish I could supersize his coat and sashay around in it. 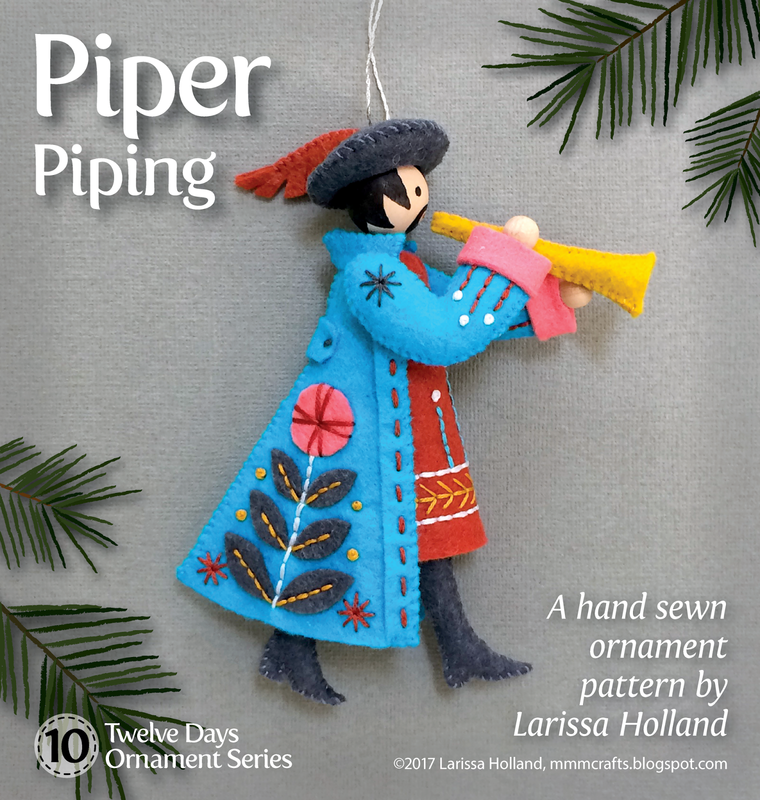 I hope you enjoy making your little pipers! Love to see what you make. 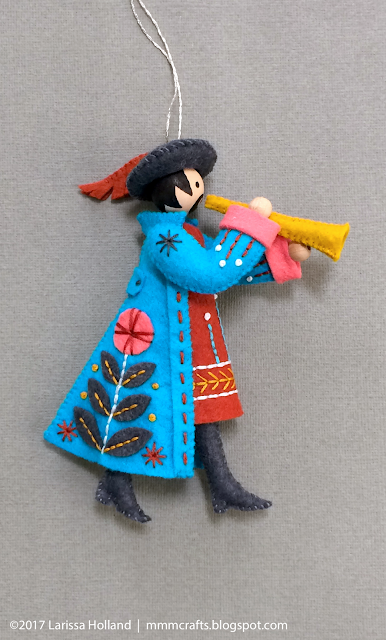 Tag on Instagram with @mmmcrafts and #twelvedaysornaments. Getting close to the end, y'all! I've got Lady Dancing* started. I am still hanging firmly on to my resolve to get this series done and dusted before 2018 arrives, despite the looming travel and holiday craziness coming at me. I CAN DO THIS. I've already informed my family I will be a minimal presence for December. Like a ghost who lives in the attic. Speaking of holiday craziness, I have a Black Friday/Small Biz Saturday/Crafty Sunday/Cyber Monday sale coming in my Etsy shop, with a 20% coupon. Stay tuned for the announcement on Thursday the 23rd. *Why no alliteration for the Lady, anyways? What happened there, carol writer? She could be Lady Laughing. Lady Larking. Lady Listing. Lady Lolloping. No? 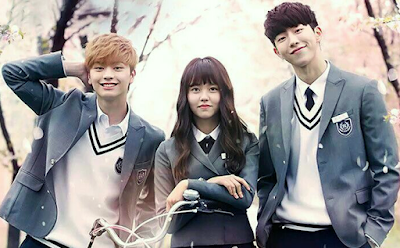 You guys might know I like love to watch South Korean dramas. For those of you who are left, perhaps you watch them too? I have a hard time explaining it to folks who don't watch them. To most Westerners who brave the subtitling, they might at first seem too slowly paced and too overly dramatic. At first. 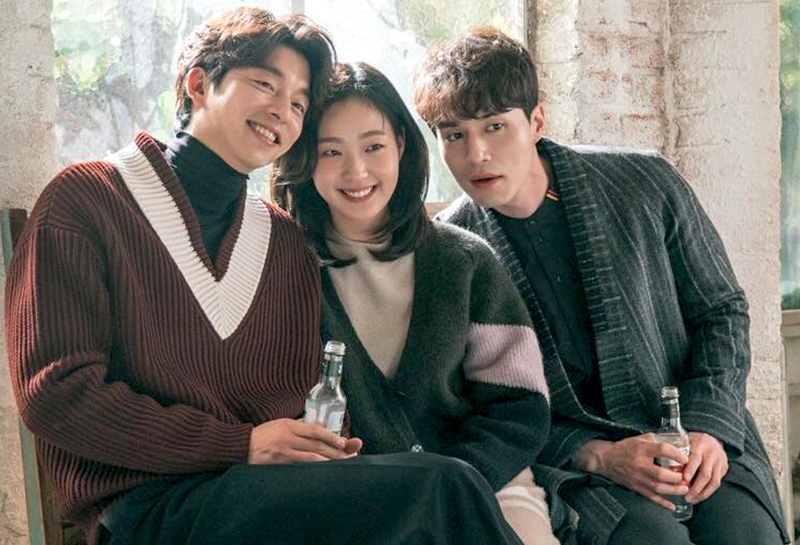 But you might hang on just because the story is intriguing, or you might be curious about Korean culture, or you might be sick of smutty American programming, or you might just like looking at impossibly pretty people wearing great jewelry. Then somehow you get sucked into DramaLand and become an honorary South Korean! Chincha! 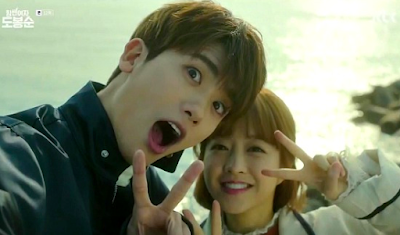 So here are some things I've learned about South Korea by watching dramas. I'm 100% positive that these facts are as reliably true as what you learn about real Americans by watching American TV. The only city that exists in South Korea is Seoul. And sometimes Jeju Island puts in a cameo appearance. 50% of the people in Seoul are rich, corporate heirs and heiresses or entrepreneurs. The other 50% are the poor but good-looking folks that the rich corporate heirs and heiresses will fall in love with in opposition to their overbearing parents. If you get a fever or a small cut you must immediately go to the hospital where there will be no waiting. By the way, most fevers are caused by Love Gone Wrong. Moms and prospective boyfriends are super serious about your not skipping meals. If you have not eaten breakfast it's a cause for major alarm. Amnesia is a very common side effect of any kind of mental trauma or a car accident. If someone hugs you, the only proper thing to do is stand there looking shocked with your arms hanging down. DO NOT HUG THEM BACK. If you are in love with the person who is hugging you, and that person knows it, and everyone else knows it, it is then permissible to gently pat them in slow motion on the back while looking embarrassed. But still do not embrace them. If you are sick, the man or woman of your dreams will make you rice gruel and hand spoon it to your mouth. You will immediately recover. There is a Holly's Coffee shop every 50 feet in Seoul. High school is made up of cutthroat girl gangs in plaid mini skirts who roam the streets looking to take your money. The only thing most people fantasize about eating is convenience store cup ramen noodles. It is a sign of True Love if it starts to rain and then you realize someone is silently holding an umbrella over you. All lithe young men seem to have a camera in their shower. If your parents divorce, you will be abandoned with a mean relative while they go get new families. And at least one of your parents will move to America and never be seen again. Birthday cakes are always presented on top of the box they come in. There is a fried chicken shop every 50 feet in Seoul. It is a sign of True Love if someone notices a tiny cut on you, immediately consigns you to a park bench, sprints to a pharmacy, buys disinfectant and bandages, returns, blows on the cut, and spends minutes in utmost concentration putting on a bandaid. If you like someone unabashedly and openly and seem the perfect match for them, ALERT: you are the second male lead. You are deep in the FriendZone. And it's likely you will die in some sacrificial way by the end of the drama, so get your affairs in order. Nothing of consequence is ever discussed until you have one of the following beverages in front of each of you: 1) hot tea in fancy cups 2) iced cafe Americano 3) layered elaborate fruit drinks with whipped cream on top. Under no circumstances will you drink these drinks during your talk. If you sit down to discuss anything of consequence with just a plain glass of water, someone will be wearing it in under five minutes. Marriage is not about love. It's about showing up your high school friends that you never liked but are somehow still hanging around with ten years later. There is an exclusive designer bag shop every 50 feet in Seoul. If anything has gone awry in your life, group karaoke and a few drinks will fix it. A sign that you have made it big in life: you have a special glass display case for all your watches. If your oppa (male love interest) doesn't lunge for your wrist as you are walking away, it's not True Love. If your oppa grabs your wrist without even looking, it's Double True Love. Any 'American' in a drama 1) will mysteriously speak with a heavy European accent 2) will have never taken even one acting lesson 3) will likely be waving a gun or signing a multi-million dollar deal. There is a Subway sandwich shop every 50 feet in Seoul. If your oppa doesn't return your feelings and you find the focus of your life is now to kidnap/publicly humiliate/falsely arrest his virtuous love interest, ALERT: you are a mean girl. You will die alone. If you are down on your luck, go spend the night in a sauna and wear a towel Princess Leia style on your head. Good looking high school boys are routinely mobbed wherever they go by worshipful high school girls who keep snapping pictures with their phones and saying how dreamy he is right in front of him. He cooly accepts this as his due. Good looking adult corporate heirs are routinely mobbed by female secretaries and underlings who keep snapping pictures with their phones and saying how dreamy he is right in front of him. He cooly accepts this as his due. It's True Love if your oppa reaches across you to put on your seatbelt. If your legs are tired or sore, ball up your fist and hit them two or three times. This makes a handsome oppa appear in a luxury KIA sports coupe. America is considered a land of milk and honey where lucky and/or rich people go to live the high life or get Ivy League degrees. America is considered a depraved and violent cesspool, where innocent people learn to be indiscriminate huggers and speak to their elders disrespectfully. There is an outdoor soju bar in a tent every 50 feet in Seoul. Accidental time travel happens all the time and never ends up anywhere but in the Joseon era in the royal palace complex. Usually in the royal bath house. The best way to peel a boiled egg is to crack it on your forehead. If someone kisses you, the only proper thing to do is stand there looking shocked with your eyes wide open and arms hanging down. DO NOT KISS THEM BACK. You know you are in like Flynn with someone's parents if their mom reaches over with chop sticks and puts some meat on top of your rice. It is not weird to have a kiss that lasts for the entire duration of a Kpop ballad, with no one moving their lips at all. It is winter three seasons a year in Seoul. High schools boys fall into three categories: 1) poindexters 2) street thugs or 3) painfully beautiful and gifted orphans with great hair. A sign of True Love is when someone grabs you and whirls you around so that a motorcycle doesn't run you down and/or splash water on your pretty dress. You should wear a shocked expression while this is repeated in slow motion two or three times. All mothers immediately and irrevocably hate the girl their son loves and will routinely offer her money to go away. Under no circumstances clear up a simple misunderstanding by communicating properly. Wait three episodes before you do this. No one turns on the heat during winter. No one notices this even though their breath is crystallizing in their living room. It's True Love if cherry blossoms are falling around you. Any oppa worth having will cart you for miles piggy-back style if you 1) drink too much soju 2) break the heel off your shoe 3) have a fever caused by Love Gone Wrong 4) are a mermaid. There is a cook-your-own-pork-belly restaurant every 50 feet in Seoul. Young, good looking, and conservatively raised people will inevitably end up living with/spending the night in close quarters with the man or woman of their dreams quite by accident and under unavoidable circumstances. NOTHING WILL HAPPEN. A few more things I've picked up from DramaLand: 1) a few Korean phrases 2) a new taste for Korean food 3) a burning desire to visit South Korea 4) the urge to bow to my elders. I watch my dramas via the DramaFever and Viki apps on my iPad and most of the time the subtitles are very well done. But as you may have gathered from the credits I've listed under the photos, they need serious help coming up with good English titles for their shows. Don't let the lame titles put you off. I've noticed that Netflix is getting quite a selection of Korean dramas, so you might try one there. They change the titles. Hah. I don't love every drama that I've watched, but I find the majority of them are worth a try. And the best thing is, they just keep making more! The pictures here are from just a few of my favorites but I have a Pinterest board with more if you are interested.